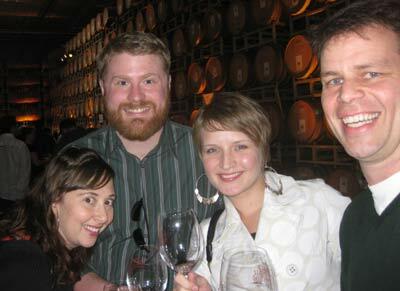 If Cockeyed.com was a weblog, I would probably write about stuff like our trip to Healdsburg for the 2009 "Wine and Chocolate" event at Rodney Strong vineyards in California. Meaghan's friend Stephanie introduced us to the event and organized the purchase of a block of tickets. Tickets were $40 each. Eleven of us drove up to Sonoma County on Saturday morning. We all got rooms at the Dry Creek Inn, AKA Healdsburg Best Western but arrived to early in the day to actually check in. Still, they didn't mind us using their lobby as a staging area. Stephanie had arranged a caravan of taxis to the event, which was about three miles south at started at 1 pm. 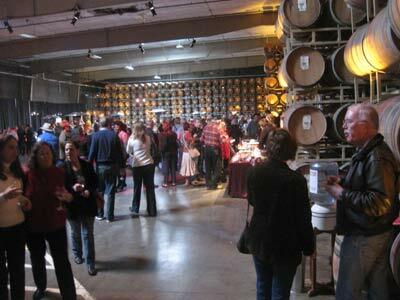 It was a classy event, and despite the casual, alcoholic theme, attendees were well dressed. I, of course, went as a giant box of See's Candy. At the entrance our tickets were exchanged for a commemorative wine glass and we were loosed upon the dark cool cavern of the winery barrel room. 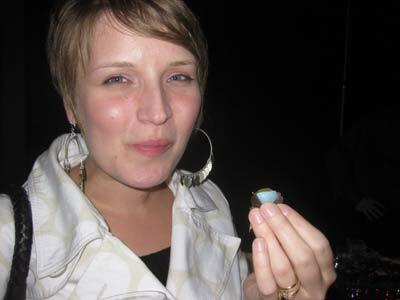 All along the wall were small stations poised with either tastes of wine or chocolate samples. There were also a few tables of hors d'oerves and water coolers. 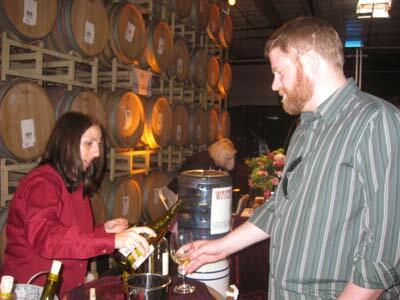 I started with a taste of one of their whites, Chalk Hill Chardonnay, and the rest of the afternoon is pretty much a blank. It was fun to be with a big group. We split up immediately but constantly re-connected inside and directed each other to the best corners of the event. The experience reminded me of the kind of event that I'd see getting screwed up on the Apprentice, so it took a minute to get settled. Soon I settled into the relaxed atmosphere and successfully avoided that dread that they were going to run out of something. Reminder: No bongs are allowed inside! 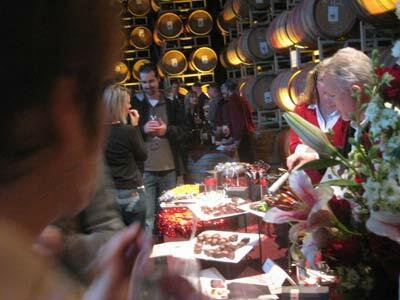 All of the wines were Rodney Strong, and the chocolate samples were from small candy makers from around the bay area. I believe there were 15 in total.The chocolate makers also showcased items for purchase. The hors d'oevre tables were popular, with breads, cheese and sausages constantly served. 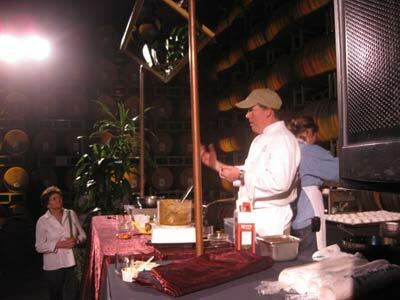 There were also a cooking demonstration (chicken mole) and a live band. 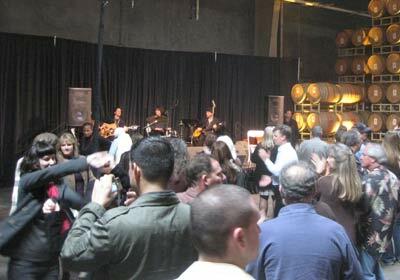 If you ever want to see an audience go from zero to 60 in a half-hour, go see a band at a wine tasting event. The party lasted for three hours, which was just long enough to see and try everything without getting bored. In the final 30 minutes, they served coffee. I should mention that I thought the barrel-stacking arrangement in the cellar looked scary to me. The barrels were stacked floor-to-ceiling on their side, supported only by the barrels themselves. 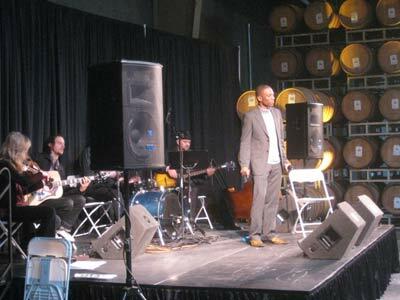 Curiously, the barrels we rapped seemed EMPTY. 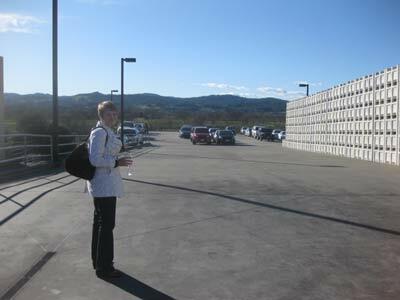 Outside, in line for the bathrooms, we spotted these jumbo juice box cages hanging out in the sun. Maybe these are the modern equivalent of barrels. 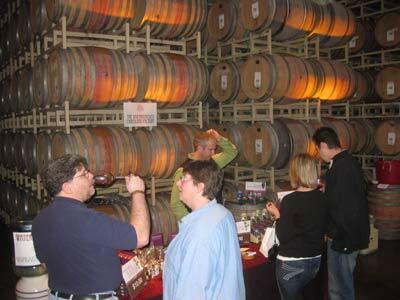 This area looked somewhat less artisian than the oak barrels. 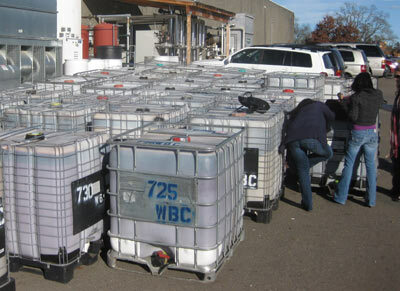 A little research revealed that they were 1,000-liter (275 gallon) Shutz Intermediate Bulk Containers (IBCs). These weren't hidden though, so I don't believe we stumbled onto Rodney Strong's super secret Chinese juice exports. 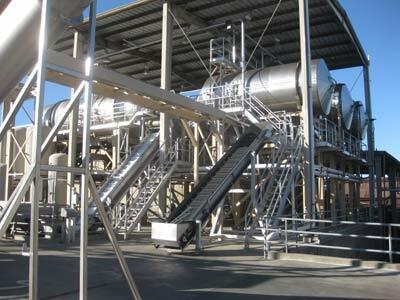 We also got a view of some gleaming grape-processing equipment. This whole metal monster was spotless, which was kind of crazy considering it was outside. 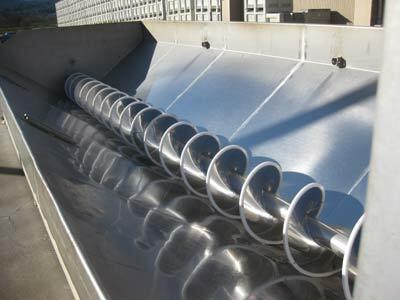 My favorite bit was this huge stainless steel auger. Either this thing was brand new or someone spent 6 hours cleaning it the night before. A lovely bit of machinery, but a terrible thrill ride. Stacy facing the grape wall. It ended at 4 and we queued up for our taxi caravan back to the hotel. A few limousines arrived to pick up guests, but I didn't see any other taxis. That was shocking. 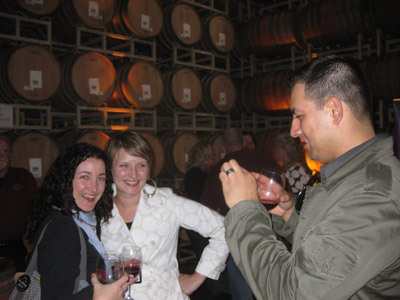 Do people really drive home after a three-hour wine tasting event? It was a pretty fun gig. No one got blind drunk, we all got back to the hotel safe and in great spirits, and in a couple of hours were ready for a dinner out.